Nothing earth shattering here, all Next, Next, Finish…. 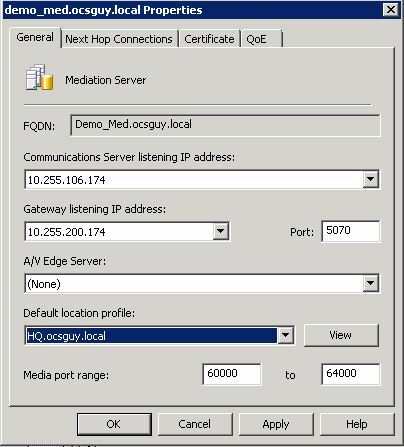 Here we see our Mediation servers FQDN and List IP Ports, all but the IP for trunks will be automatically populated. For the internal Dial Plan all fields are populated; notice the 1-555 is in use. This prefix is used by SmartSIP to identify and route traffic. It is necessary to leave this as-is so SmartSIP will function properly. 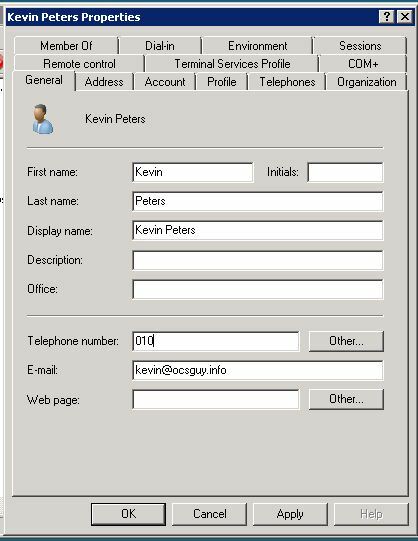 Next we can set our OCS Pool and our server FQDN Alias. It is important that the certificate for your mediation server includes this as a SAN field in the cert. 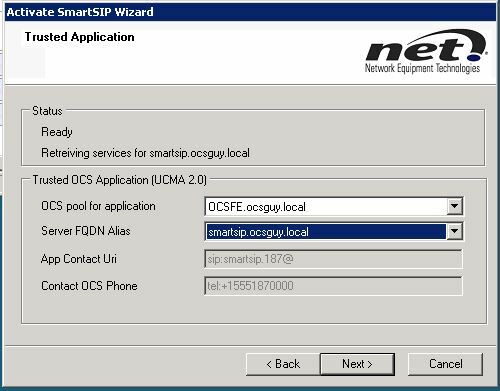 In this example “smartip.ocsguy.local” should be an A record pointing to the data network IP of the Mediation/SmartSIP server and an entry in the Subject Alternate Name field in the certificate. 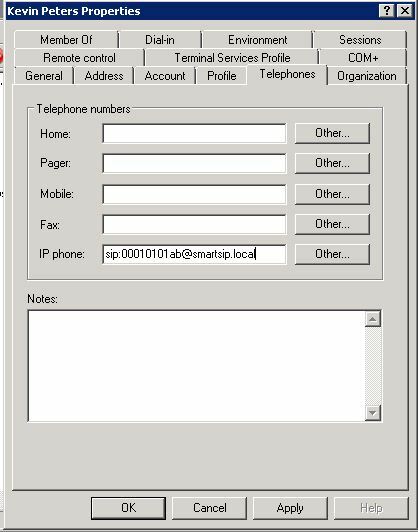 Once activation is complete we are going to utilize the “Telephone number” and “IP Phone” fields in AD. We’ll start with the Telephone number field. This will be populated with a unique extension. 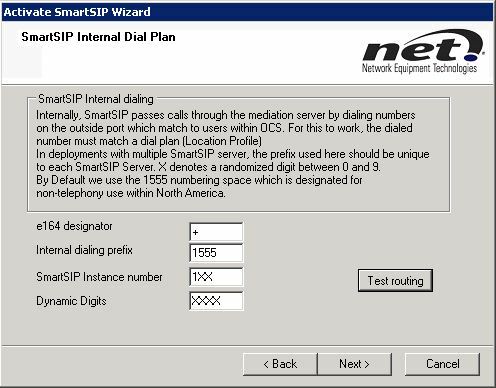 In this example I will use the last 3 digits of the users DID, this information is only utilized by SmartSIP and isn’t seen by the client directly. 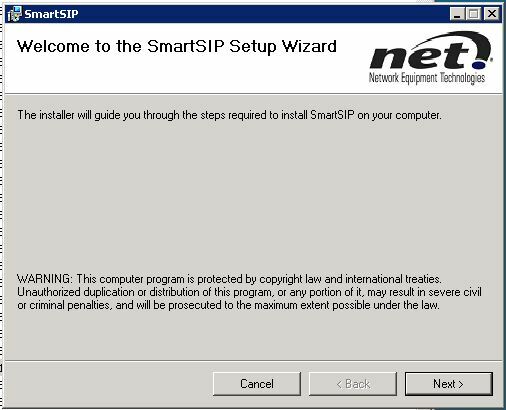 Although we see “smartsip.local” in the above screen shot, there is no DNS resolution required, this is for SmartSIP’s internal use only, you won’t need to create a zone for it. 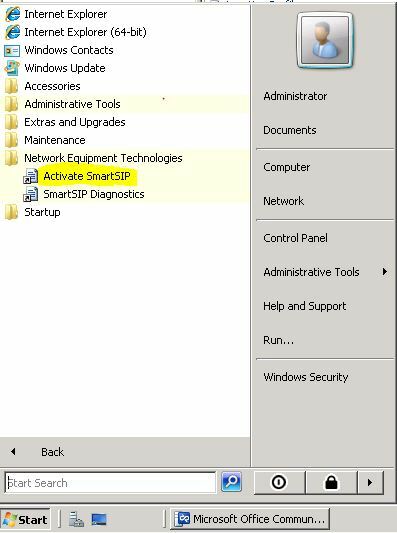 Now we set option 066 for TFTP in our environment to point to the SmartSIP server, boot the phone and start making calls. This article was written utilizing an early release version of the code so your install screens and possibly install steps might be slightly different. If you run into any issues, the quickest fix is to contact NET’s incredibly helpful support staff. 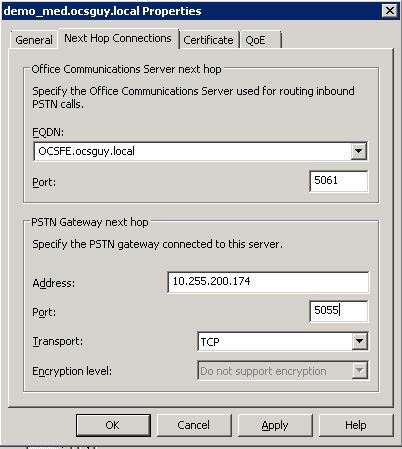 This entry was posted in Uncategorized and tagged NET, OCS, OCS 2007 R2, OCS as a PBX, Smart SIP, SmartSIP. Bookmark the permalink. Thank you for post such a nice documentation, I must congratulate you for doing such a good work,very few people are posting articles in such details on OCS. 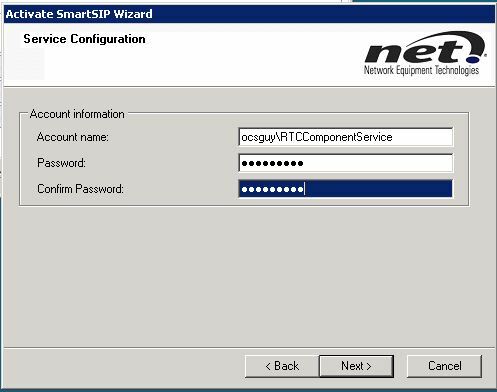 We were suppose to install OCS 2007 R2 with NET VX1200 an SmartSIP server, but our gateway got stuck for some reason in the custom and finding it difficult to release from there. 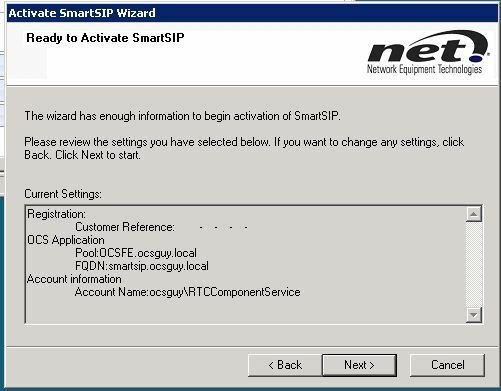 Now temporarily we have arranged Cisco Voice gate way with OCS compatibilty but we still want to USE SMARTSIP from NET. 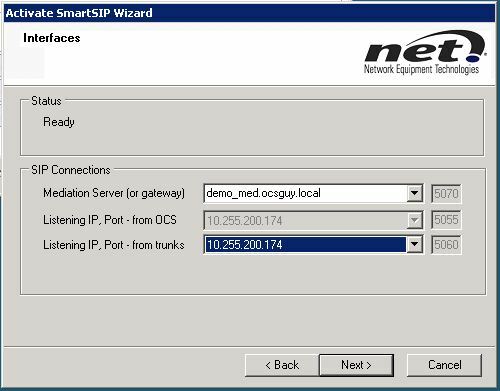 Is this software supported with Cisco Voice gateway as i saw that SmartSIP supports only NET or Quintum Gateways, such as the Tenor or VX. I’ve spoken with NET and they would not support the Trunk side (to the Cisco Voice Gateway) directly. However, SmartSIP is standards based and would likely still work in this scenario. The reasons they would not support are 1: It has not been tested with a Cisco Gateway and 2: Moving forward testing with the Cisco Platform is not likely so they could not guarantee it would continue to function if you got it working. I would certainly encourage you to contact NET for more information, the best person to contact regarding SmartSIP is Suresh and you can reach him via email at: Suresh_Tatavarthy@net.com. I hope this helps clear up any confussion, if you decided to give it a shot please post back to let me know how it goes. I have started the implementation process. 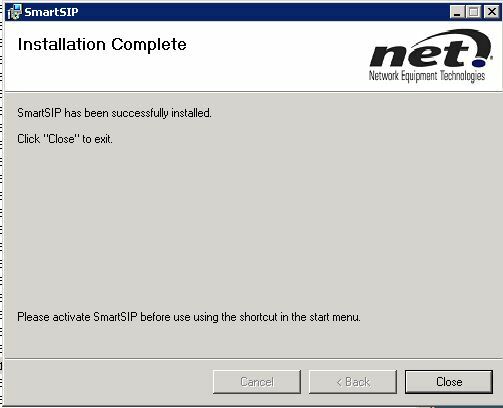 I finished the SmartSIP installation and its activation. Are all the required files there u think. As i saw the documentation which says that there should be .cfg file with name SIP[MAC].cfg should be there. In the remaining folders like polycom and linksys file with such an extension is already there in their respective brand. Can you please help on this. As i have a deadline of finishing this project in next two days. I’d recommend contacting NET support on this as my SmartSIP lab is currently down, I had to set up some more servers and didn’t have enough lab space to run everything. 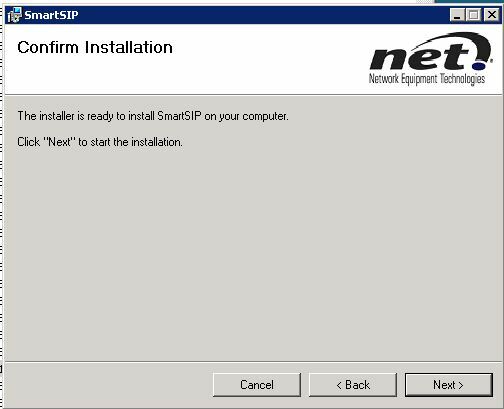 Did you get the SmartSIP software through a trial or direct purchase with NET?